YourMTB.com, a citizen media based online community for mountain bike enthusiasts and athletes, has announced several winners in its first best-photo and best-video contests, who receive prizes from GravityDropper and PricePoint.com. Best MTB action video: YourMTB.com member "970biking" won this contest with his video, "Road34 DJ Jam '06," which nicely documents some incredible biking skills exhibited at a competition held near Fort Collins, Colorado. The winner receives a GravityDropper adjustable seatpost. The video can be viewed by clicking here. Best "anti-gravity" action photo: YourMTB.com member Paul Sveda won this contest with his photo, "Gosh mister, I wish I could fly like that," a great image of a friend launching off a jump and flying through the air -- as two awstruck kids view the action from the grass next to the jump. Sveda receives a GravityDropper adjustable seatpost. The photo can be viewed by clicking here. 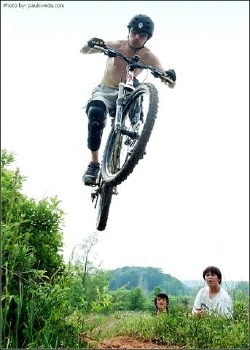 Best "MTB fashion" photo: YourMTB.com member BudH won this contest with a photo of himself looking fashionable and overly exhuberant on a mountain bike ride. He receives $50 in gift certificates to online mountain bike discount retailer PricePoint.com. The photo can be viewed by clicking here. Winners were selected from submissions of photos and videos by YourMTB.com registered users and determined by consensus of the staff of YourMTB.com and its parent company, Enthusiast Group LLC. YourMTB.com regularly operates contests to reward the best submissions by mountain biking enthusiasts -- videos, photos and tales of adventure. Entering the contests costs nothing; mountain bikers who share their images with the YourMTB.com community are automatically eligible for the best-of contests. The website also rewards a Member of the Month, the YourMTB.com user who has submitted the best quality images, stories and/or advice in the last month. The July Member of the Month will receive $200 cash. YourMTB.com also runs a weekly Post of the Week contest, currently sponsored by Pixie Mate, rewarding the most interesting content submission in the last week. YourMTB.com contests are supported by companies like PricePoint.com, GravityDropper, Pixie Mate and Spenco Cycling, which offer prizes to winners. Biking- and sport-related companies wishing to participate in YourMTB.com contest promotions should contact Steve Outing, publisher, at steve@enthusiastgroup.com or 303-543-7810. Log in to www.yourmtb.com and register to participate in the website's contests.